What Did They Really Eat At The 1st Thanksgiving? Hope you all had a lovely Thanksgiving celebration! Maybe you even had a chance to share some of the new things you’ve been learning about the Pilgrims with your family. I’m going to keep this blog post short ‘n sweet today since you might be rushing around to get a Black Friday deal. I always wondered what did the Pilgrims and their Native American friends really eat at the First Thanksgiving? We can’t know exactly, for-certain-sure because the folks who were there didn’t write it down. But looking at the foods of the era and what was available in the Cape Cod area we can make a few guesses. 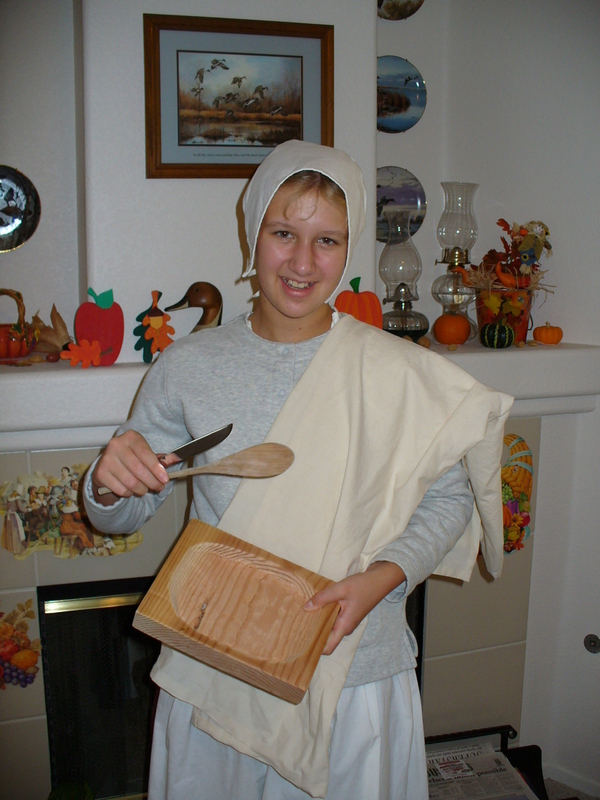 During a living history presentation (2005), Sarah shows the typical eating utensils that would’ve been used by the Pilgrims – trencher, knife, spoon, and large napkin. I particularly like the suggested menu from “The Thanksgiving Primer” which was published by Plimoth Plantation Publications in 1987. Notice how many fresh vegetables there are! P.S. So what do you think? Want to try a 1621 Feast next year or will you be staying with the modern traditions?